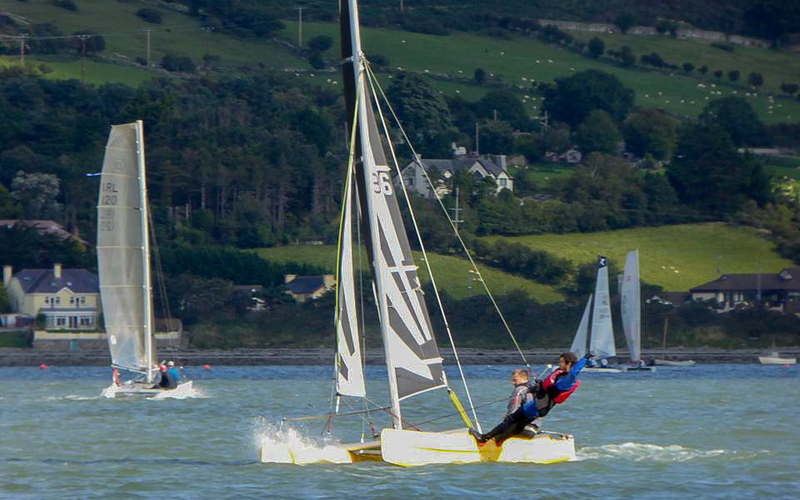 -------Carlingford Sailing Club hosted the Irish Open Multihull Championships on the 12th. And 13th of September. "We arrived on Friday night to 40 knot winds and driving rain not deterred at all we set up tents!!! And had a beer. …or two. After a few hours the tents had been trashed so several competitors had to take to the race office shed…. Very cosy welcome to Ireland Si and Lou Bala Sailing Club in Wales , Shane and Tewi Hatton all the way from Humpybong Yacht Club in Brisbane who were sailing a Hurricane 5.9SX. 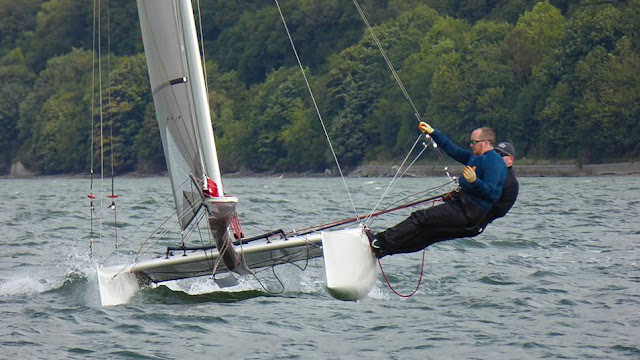 Simon Flack was over to defend his title won last year at Lough Neagh, sailing this year with multi-Irish champion crew Barry Swanston sailing on Adrian Allens Cirrus R.
The open fleet format with all types of catamaran from a catapult to an F18 rated under SCHRS and racing an equal number of windward – leeward and triangular courses (to balance performance strengths) was used with all boats starting off the same start line. Classes were also subdivided into C1 and C2 fleets for individual fleet prizes. Saturdays forecast was gloomy to say the least. Rain and 25knot baseline gusting to 40 knots from the S.W., to this add the infamous Carlingford Kettles roaring off the top of the hills at all angles ripping up mini tornadoes of water that march and meander across the Lough ….not to be missed!! 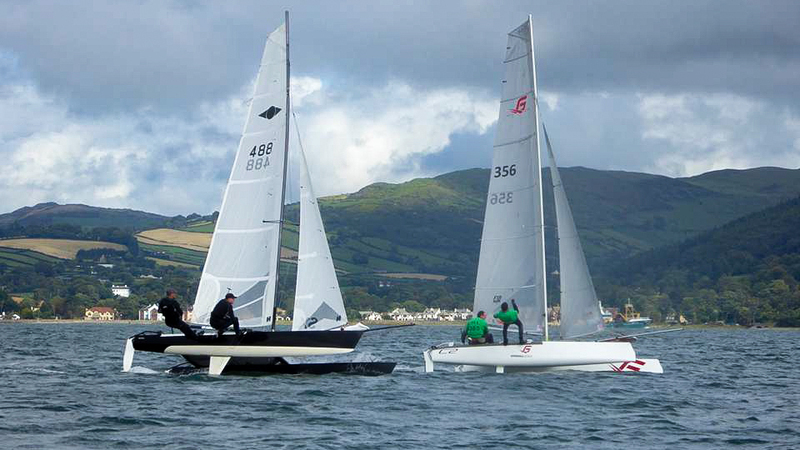 We were treated to an unexpected two races in variable but safe conditions. Race 1. Swannie and Jenni executed a perfect port tack start only to fall into the pack mid first beat, the fleet then had several place changes throughout the race with Simon Flack and Barry quickly getting used to the Cirrus had a great race with Wyatt Orsmond and Patrick Billlington in their new Goodall C2. With an increase to the breeze the Hurricane 5.9 sx with it’s Irish Aussie pair were flying Wyatt pipped them at the post to secure his first bullet. Swannie and Jenni Brittain 3rd. Race 2. 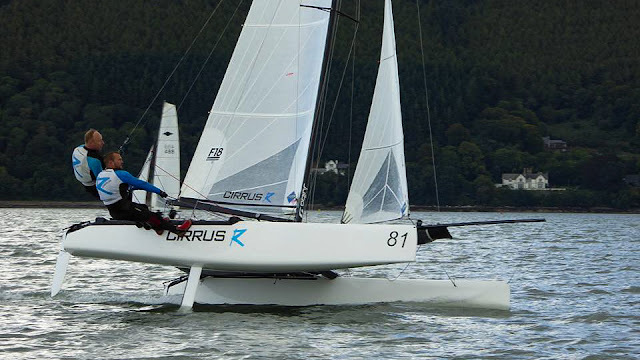 Again the pattern was set with the C2 and Cirrus leading the way with very competitive sailing throughout the race Simon settled to the Cirrus and pulled off a great first place over the C2 with the Shockwave in 3rd. 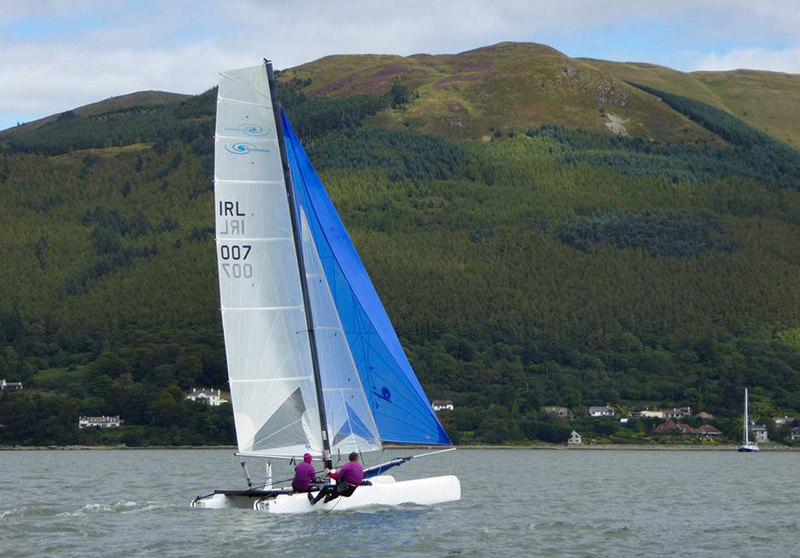 Sunday sore heads woke to a much more benign weather picture with Carlingford looking its glorious best, a gentle southerly 4knots to 8knots the forecast. We all sailed out in sparkling 10-12 knots kites up in bright sunshine!! 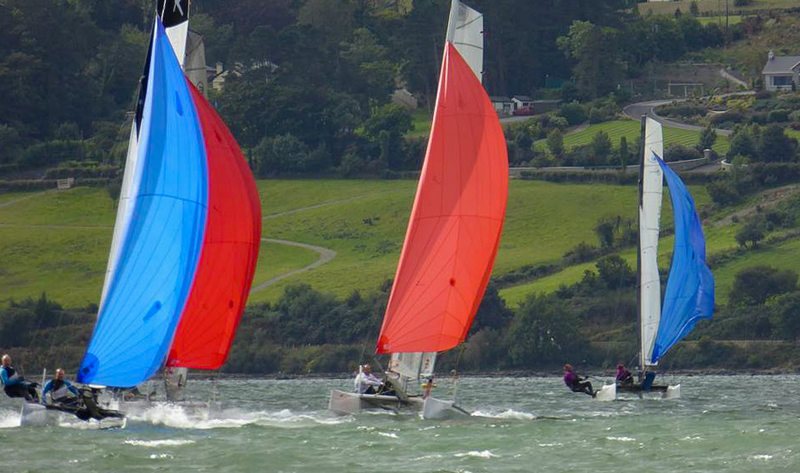 Race 3 (Triangle course) With the wind freshening racing was tight in both the C1 and c2 fleets. Simon and Barry again came out on top with the C2 in 2nd place with the shockwave coming in 3rd again. Race 4 (Triangle course) Wind was now a steadyish 15- 18 knots, with the tidal influences beginning to take effect, the judging of lay line was proving critical both upwind and downwind, Swannie was boxed out whilst leading at the start finish gate and the leaders then misjudging the downwind gybing angles to allow the fleet to group together for a frantic last high speed lap. David Biddulf sailing with newbie to cats Stephen Magee had an incredibly close race with Si and Baz to win by 1 second with Wyatt in the C2 snapping at their heels 19 secs behind. Hurricane 5.9SX showing some blistering pace up wind and down unfortunately having some gear failure lead to a clearing of the heads! The Shockwave in third place again. Race 6 Belonged to Wyatt and Paddy in their C2 leading from start to finish Swannie and Jenni showed some great pace in the breeze to have a dingdong battle with Si and Baz the battling Jenni (girlfriend) beating the master of the hoist baz (boyfriend) to the fill the kite and powered over the Cirrus at the spreader mark. The battle continued to the last beat when just as the Shocker rolled the Cirrus Swannie’s mainsheet broke! The white sail boats had close racing between Dermott Mangan ( dad) in his amazing Catapult and Neil Mangan(son) with Simon Griffin as crew on their Dart16. Both gaining excellent overall placing under S.C.H.R.S. They may have done even better with a longer second leg to the gybe mark improvoing the angle between the marks. So overall went to Simon Flack and Barry Swanston by one point. Great racing !! 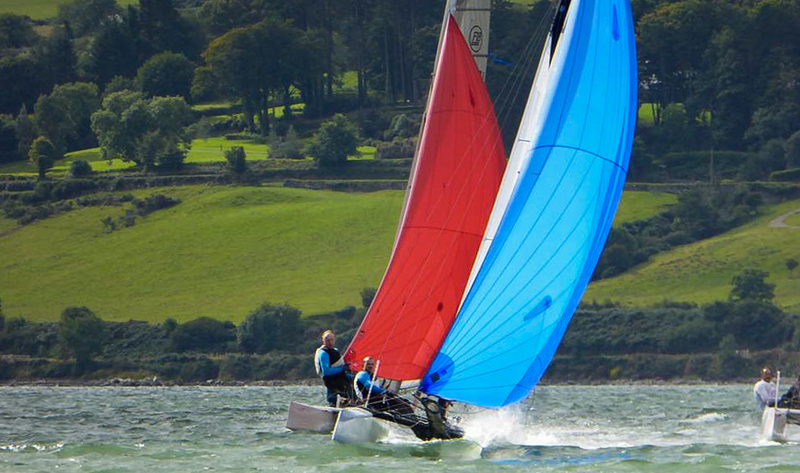 C2 fleet was won by Neil Mangan from the evergreen Dermot Mangan. Travellers Trophy was won by Wyatt.